Not that long ago I wrote about how some companies create bad rules that are based on a very small percentage of customers taking advantage of the company. Sometimes this creates a negative and un-friendly policy that can erode good relationships that the company might have with their customers. Up until recently, whenever I walked into the Guitar Center, I had to “check in” at a central kiosk. If I was bringing in a piece of equipment to be repaired or an item to be returned, I would have to show it to an employee at a “security desk” who was there to document what was coming in and checking all that was going out. Apparently, they implemented this policy to combat shoplifting at the stores. When I talked to a manager of one of the stores, he said shoplifting was problem plaguing the company to the tune of about $2 million a year. That’s a lot of guitars! Now, I never really cared one way or the other about the security desk. It was a relatively minor inconvenience. I realized why it was there and just accepted it. There might be other ways to help prevent theft. Then, one day I noticed it wasn’t there. So, being the inquisitive person I am, I had to ask why. Apparently, they figured out the cost to operate the security desk and protect themselves from shoplifters was more than the cost of merchandise being stolen. So Guitar Center decided to do away with the security desk altogether. And the decision was beneficial for the company and their customers. I believe the concept of having someone at the front to check customers coming in and going out, if handled well, can be a neutral experience at best. In reality, the process designed by Guitar Center to thwart dishonesty was a minor inconvenience to most of their customers, and more importantly, a major cost to the company. By getting rid of the security desk, Guitar Center was able to undo a bad policy. They were able to cut costs and improve the customer experience. That’s not an easy thing to accomplish. What if a hotel tried to cut costs by getting rid of their bellhops and concierge staff? Customers might be unhappy as they hauled their heavy bags up to their rooms, or had to wait in long lines to check in or out. In this situation, and many cost-cutting cases, the customer experience suffers. There used to be a restaurant that I enjoyed on a somewhat regular basis. On my last visit, and I mean final visit, not most recent, I noticed the food tasted different – and the difference was worse, not better. I made a comment to the owner who informed me that he was trying to cut costs. One of the ways he did that was to change the recipes to save money. While I appreciated the honest explanation he fell into the trap of cutting costs at the expense of the customer’s experience. In this case, it was the taste and quality of the food, and it was bad enough I didn’t want to go back. So, why did Guitar Center’s decision strike such a positive chord? (Pun intended. Get it? Guitar. Chord.) Easy. They eliminated a process that was all about them, which was attempting to thwart shoplifters. In doing so they saved money and at the same time enhanced the customer experience. That’s a winning combination that is not all that easy to achieve. The big lesson here is that when many companies try to cut costs, they do so at the expense of the customer experience. 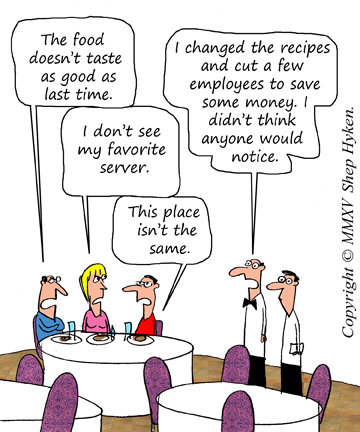 The goal is to find a way to cut costs that aren’t noticed by the customer.